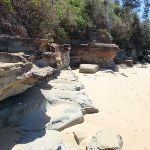 A great walk along the beach and rocky shoreline near Bateau Bay. 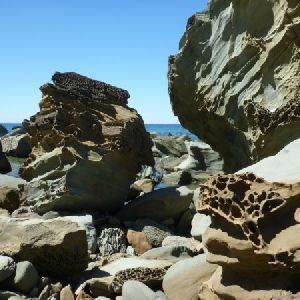 The unnamed, rocky beach below Crackneck Lookout is a beautiful spot and there are plenty of interesting shapes and textures in the rocks and rockshelf along the way. 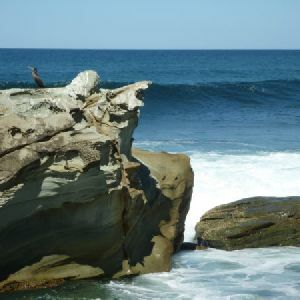 There is a bit of rockhopping, but much less than when approaching ‘Crackneck’ beach from the south. 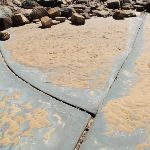 Parts of the walk are very exposed to the ocean and should not be attempted at high tides or during high seas. * This walk passes through very remote areas and sections have no visible track. At least one person in your group should have training and experience in off track walking and navigation. Even with these notes and a GPS these extra skills and equipment are required. 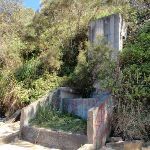 This unnamed picnic area and lookout is within Wyrrabalong National Park, at the intersection of Reserve Dr and Harbour St, Bateau Bay. 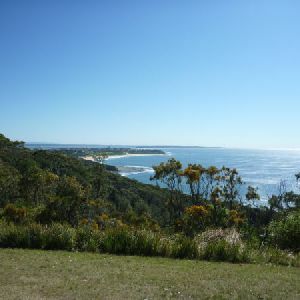 The picnic area overlooks Bateau Bay and the beach. There are large grass areas, plenty of shade and facilities including picnic tables, garbage bins, and beach access steps. 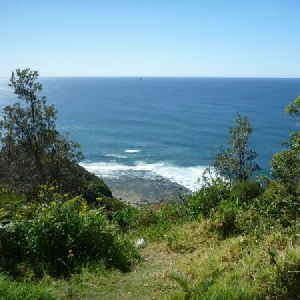 There are beautiful views along the coast and out to sea from the picnic area. 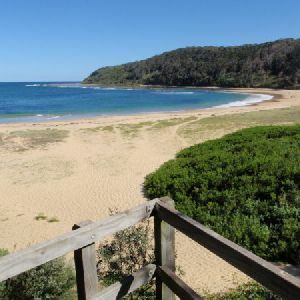 There are free electric BBQs at Sutton Reserve, a block further south along Reserve Dr. Takeaway food is available at a small shopping centre near the intersection of Harbour St and Bateau Bay Rd, one block from the picnic area. 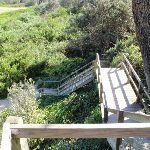 From the intersection, this walk goes down the timber steps, towards the beach. 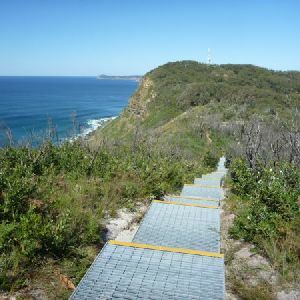 The walk follows the boardwalk and timber steps down the hill until reaching Bateau Bay Beach. 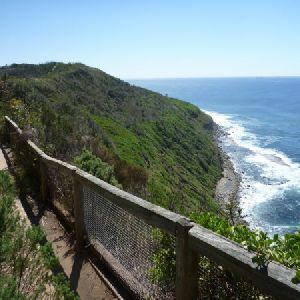 Continue straight: From the bottom of the northern Bateau Bay Beach access stairs, this walk goes south along the beach, keeping the ocean to the left. 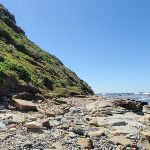 Towards the southern end of the beach, the walk arrives at the base of some concrete steps, beside a concrete management trail. 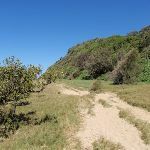 Turn left: From the bottom of the southern Bateau Bay Beach access track (beside the concrete management trail), this walk goes south across the sand, keeping the ocean to the left. After a very short distance, the walk arrives at the southern edge of Bateau Bay Beach, with a much narrower strip of sand continuing south. 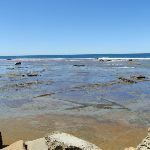 Continue straight: From the southern end of Bateau Bay Beach, this walk goes south, along the narrow strip of sand, keeping the ocean to the left. 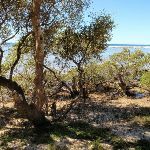 The walk passes a concrete stormwater outlet (to the right) and a short distance later reaches the end of the sandy strip, with some mangrove trees to the left. 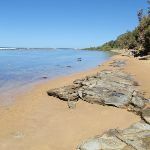 Continue straight: From the end of the narrow beach strip, this walk passes some mangrove trees, to the left, and follows the sandy track south, keeping the ocean to the left. 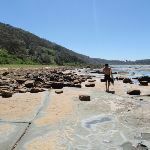 After a short distance, the walk reaches the end of the sandy track, at the rockshelf. 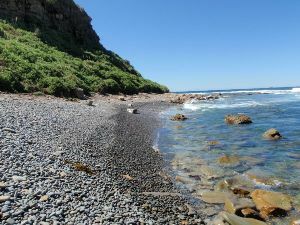 Continue straight: From the end of the sandy track, the walk goes across the rockshelf, following the coastline south, keeping the ocean to the left. 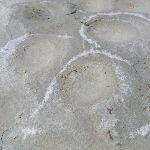 There are some interesting textures in the rock, with some regular, angular cracks in places, making for some intriguing scenery. 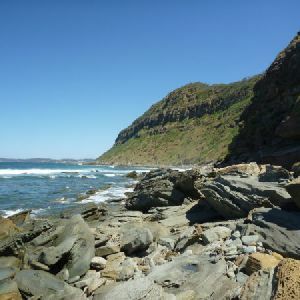 The walk then goes around the headland and continues a short distance to the unnamed beach beneath Crackneck Lookout, covered in rounded fist-sized rocks. 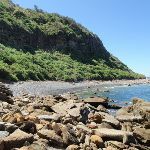 This unnamed beach is below Crackneck Lookout and can be reached with some difficulty by walking along the very rocky shoreline from Forresters Beach, to the south, or from Bateau Bay beach, to the north. 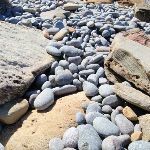 The beach is covered in rounded rocks about the size of a fist. 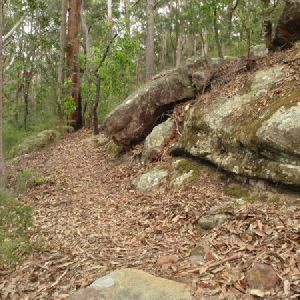 Around 1.1km of this walk has gentle hills with occasional steps, whilst the remaining 570m has short steep hills. 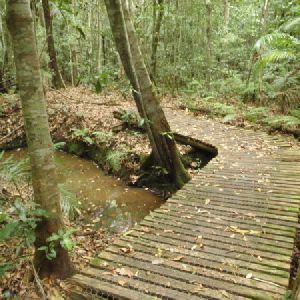 870m of this walk follows a rough unclear track and another 730m follows a rough track, where fallen trees and other obstacles are likely. 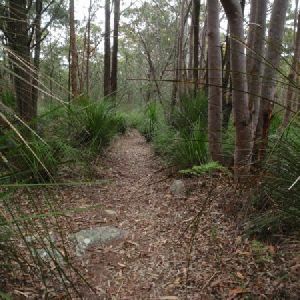 The remaining (110m) follows a clear and well formed track or trail. Around 1.6km of this walk has minimal directional signs, whilst the remaining 110m has directional signs at most intersection. 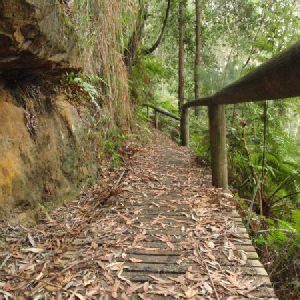 Around 1.2km of this walk requires some bushwalking experience, whilst the remaining 470m requires a leader a with moderate level of bushwalking experience. 710m of this walk is affected by storms that may impact your navigation and safety and another 530m is not usually affected by severe weather events (that would unexpectedly impact safety and navigation). The remaining (470m) is affected by forecast, unforecast storms and severe weather events that may impact on navigation and safety. 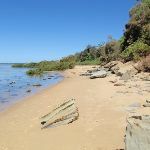 Around 1.6km of this walk has limited facilities (such as cliffs not fenced, significant creeks not bridged), whilst the remaining 110m has limited facilities (such as not all cliffs fenced). 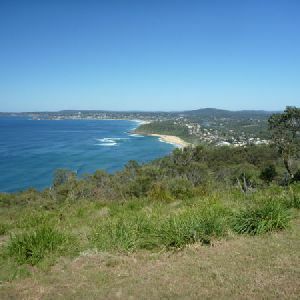 A list of walks that share part of the track with the Bateau Bay Beach to Crackneck Beach walk. 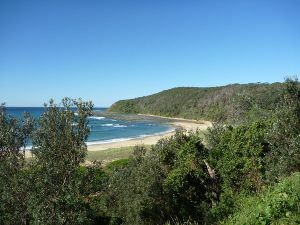 A list of walks that start near the Bateau Bay Beach to Crackneck Beach walk. 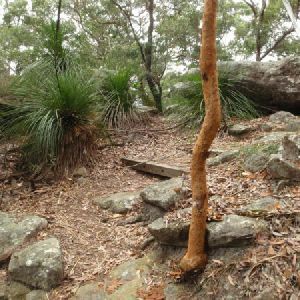 http://new.wildwalks.com/wildwalks_custom/includes/walk_fire_danger.php?walkid=nsw-wyrrabnp-bbbtcb Each park may have its own fire ban, this rating is only valid for today and is based on information from the RFS Please check the RFS Website for more information.